The historical town of Filadelfia is a gateway to some of Guanacaste’s most beautiful beaches. Also known as “the Archeological City,” this town has everything that residents need to conduct day-to-day business, yet also has beaches and other major tourists attractions close by. Before the tourism boom, this traditional town was devoted to the harvesting of sugar cane and melons. Now, the town boasts constant high speed Internet, supermarkets, banks, bars, shopping centers, restaurants, and much more, making Filadelfia the perfect place to call home. People contemplating purchasing property in Filadelfia or relocating here will find a variety of housing options for all budgets and desires. Many find Filadelfia real estate—which is less than a half an hour away from Liberia and the international airport, within minutes of Costa Rica’s breathtaking beaches, and yet a fraction of the price of real estate in other nearby beach towns—is the perfect opportunity to invest in Costa Rica. Filadelfia is a booming Guanacaste town excellent for working families to settle down or professionals to have a vacation home from which they can do business. Its location on the major Liberia-Nicoya highway makes it a prime location close to recreation and commerce. Expats and people looking to retire in Costa Rica will also find a number of English speaking and American quality services here for comfort. 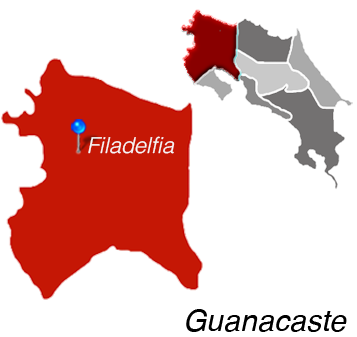 Filadelfia is in the center of the Tempisque Valley, and Filadelfia’s real estate includes rolling plains surrounded by a number of beautiful hills. Flat lots in and around town are great for building homes to the likes of each investor, including luxury homes. Villas, condos and single-family homes are also available, and some have the luxuries of beautiful tile floors, high-end fixtures, and stainless steel appliances. Many homes come with large yards, fruit trees, and private entryways. Filadelfia is Located in Guanacaste.